Got a question about Scott® products? We got answers! If you can't find what you're looking for, please contact us. 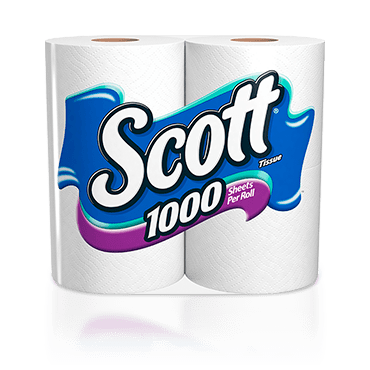 Why is it called Scott® 1000? Scott® 1000 gives you 1000 septic-safe sheets, with the quality and long-lasting performance you want at the value you expect. Is SCOTT® 1000 toilet paper made from recycled materials? SCOTT® 1000 may contain some recycled fiber. The cardboard cores for all SCOTT® Bath Tissue use 100% recycled paper. SCOTT® Extra Soft is made from 100% virgin fiber. SCOTT® Tube-Free packaging is made of 20% recycled material. IS IT SAFE TO USE IN MY BOAT AND RV? Yes. SCOTT® 1000 passes water breakup tests and is therefore safe for RVs and boats. WHEN WAS SCOTT® 1000 INTRODUCED? In 1913, SCOTT Paper Companies SNO-Tissue was renamed SCOTT® Tissue, marking the beginning of SCOTT® Brands. WHY IS UPROMISE® NO LONGER PRINTED ON THE PACKAGING? SCOTT® Toilet Paper and SCOTT® Flushable Wipes are no longer participating members of Upromise®; however, we do participate in the Box Tops for Education program. IS SCOTT® 1000 SAFE FOR SEWER AND SEPTIC SYSTEMS? Can I recycle the Scott® 1000 packages? Paper wrap can be added to curbside recycling along with paper. WHY DID YOU DISCONTINUE SCOTT NATURALS® TUBE-FREE? Scott Naturals® Tube-Free is still available, but with revamped packaging and a new name! Please look for Scott® Tube-Free in its new blue and orange package. We apologize for any confusion this may have caused. This is still the same product you have grown to love, without the tube. IS YOUR PRODUCT NOT NATURAL ANYMORE SINCE YOU REMOVED THAT WORDING FROM THE PACKAGE? Scott® Tube-Free is still the same product you have grown to love, without the tube. We have not changed the manufacturing process, and the product is the same. In addition, it is still FSC-certified with at least 20% of the packaging made of recycled content. WHY DID YOU CHANGE THE TUBE-FREE PACKAGING AND REMOVE "NATURALS" FROM THE PRODUCT NAME? We removed the word "Naturals" and changed the green from the packaging to better communicate our value. After consumer research, we discovered that some consumers expected the product to be of a lower quality when it was labeled as "Naturals." The change in branding better communicates that the product has the same quality consumers have come to expect from the SCOTT® Brand, just without the wasteful tube. We have not changed the manufacturing process, and the product is the same. In addition to being made without the tube, Scott® Tube-Free is still FSC-certified with at least 20% of the packaging made of recycled content. WHERE CAN I FIND SCOTT® TUBE-FREE? Click here to find this product in a store near you. If you'd rather skip the store, Tube-Free is available for purchase online at a variety of e-retailers. HOW DOES TOILET PAPER WITHOUT A TUBE WORK? 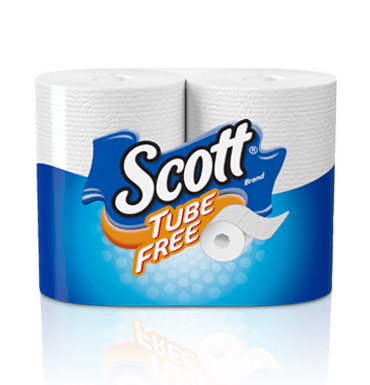 Scott® Tube-Free works like toilet paper with a tube! The only difference (besides the cardboard) is the manufacturing process, which is altered in a unique way to ensure each roll holds its own structure and shape. It unrolls similarly to cored toilet paper, but now you can use every single sheet. WILL IT FIT ON MY TOILET PAPER HOLDER? Scott® Tube-Free has an opening in the middle of the roll similar to toilet paper with a tube. It can easily slide onto the spindle and is designed to stay in place like regular toilet paper does. HOW IS SCOTT® TUBE-FREE MADE? Scott® Tube-Free is made like regular toilet paper except we use specialized equipment to wind the roll. This is a patented process, exclusive to Kimberly-Clark. IS THE TOILET PAPER MADE FROM RECYCLED FIBER? Scott® Tube-Free is made from FSC-Certified Fiber. FSC® certification ensures that the paper used in our bath tissue comes from responsibly managed forests and other verifiable sources that meet specific environmental, social and economic standards. IF I SWITCH TO SCOTT® TUBE-FREE, HOW MANY TUBES CAN I SAVE? WHAT IF I NEED THE TUBES FOR CRAFTS? Although we've removed the tube from Scott® Tube-Free, Scott® 1000, Scott® ComfortPlusTM and Scott® Towels all have tubes. IS SCOTT® TUBE-FREE SAFE FOR SEWER AND SEPTIC SYSTEMS? IS SCOTT® TUBE-FREE SAFE TO USE IN MY BOAT AND/OR RV? Yes. SCOTT® Tube-Free passes water breakup tests and is therefore safe for RVs and boats. Can I recycle the Scott® Tube-Free packages? IS SCOTT® TOILET PAPER MADE FROM RECYCLED MATERIALS? SCOTT® ComfortPlus™ is made from 100% virgin fiber. SCOTT® 1000 may contain some recycled fiber. The cardboard cores for all SCOTT® Bath Tissue utilize 100% recycled paper. SCOTT® Tube-Free packaging is made of 20% recycled material. Will Scott® toilet paper products fit in my current holder? Most SCOTT® Toilet Paper products require no special adapter - our long-lasting rolls fit most standard dispensers. WHERE CAN I FIND SCOTT® COMFORTPLUS? SCOTT® ComfortPlusTM can be found in most places where toilet paper is sold. If it is not available in the store you shop in, ask the manager. DOES SCOTT® COMFORTPLUS™ REPLACE SCOTT® 1000? No, SCOTT® ComfortPlusTM is an addition to the SCOTT® toilet paper family lineup. We will continue to make our 1,000-count toilet paper, which has been around since 1913! 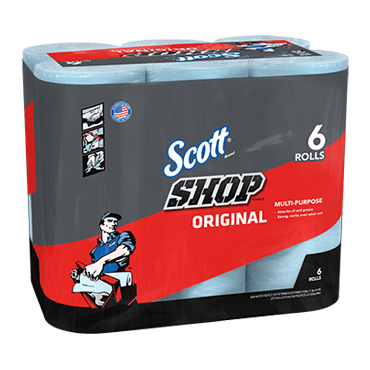 WHERE CAN I FIND MORE COUPONS FOR SCOTT® PRODUCTS? From time to time, coupons or special offers for SCOTT® products are advertised in newspapers, available on our website and through e-newsletters. Occasionally you will also find coupons and other offers advertised at various retailers or on our packages. Please sign up for ongoing news and savings at https://www.scottbrand.com/en-us/secure/sign-up. IS SCOTT® COMFORTPLUS™ SAFE FOR SEWER AND SEPTIC SYSTEMS? IS SCOTT® COMFORTPLUS™ SAFE TO USE IN MY BOAT AND/OR RV? Yes. SCOTT® ComfortPlusTM passes water breakup tests and is therefore safe for RVs and boats. What happened to SCOTT® Extra Soft? 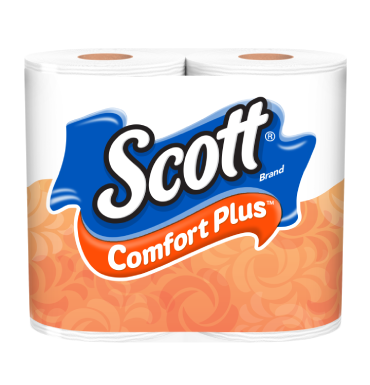 SCOTT® Extra Soft is being replaced with SCOTT® ComfortPlusTM. With new packaging and improved product features we know you will love it. Find it at your favorite retailer in the toilet paper aisle. Can I recycle the Scott® Comfortplus™ packages? ARE SCOTT® TOWELS MADE FROM RECYCLED MATERIALS? SCOTT® Paper Towels are made from 100% virgin fiber. SCOTT® Towels, with our proprietary sensible blend of fiber mix, contain 60% recycled fiber. 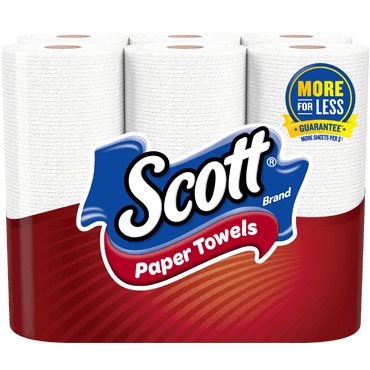 The cardboard cores for all SCOTT® Towels utilize 100% recycled paper. WHEN WERE PAPER TOWELS FIRST INVENTED? In 1907 Scott Paper introduced SANITOWEL paper towel, the first paper towel in America. Sanitowel was designed to be used in Philadelphia schools to help promote good hygiene in the classroom. The overwrap has a recycle code of #2. IS IT SAFE TO USE SCOTT® PAPER TOWELS IN THE MICROWAVE? SCOTT® Towels are designed for a wide variety of household wiping and cleaning purposes. However, if the product is used for microwave cooking, we recommend that you always note the precautions and follow the guidelines outlined in the microwave oven owner's manual. Do not dry herbs, vegetables or flowers on paper towels in the microwave oven. Any paper product can burn during microwave cooking if conditions are right. 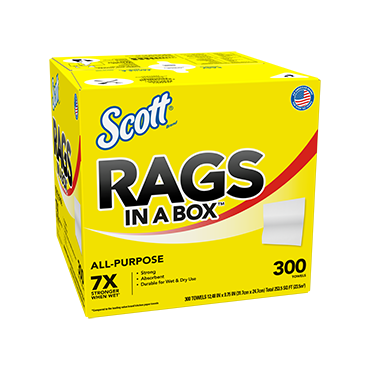 WHERE CAN I FIND INFORMATION ON SCOTT® SHOP TOWELS AND SCOTT® RAGS? For information on SCOTT® Shop Towels and SCOTT® Rags, and other fine home improvement and car care products from Kimberly-Clark, visit Do-it-Yourself with K-C DIY. DESCRIBE THE MANUFACTURING PROCESS FOR SCOTT® TOWELS. At the towel manufacturing mills, bales of pulp are fed into a machine called a "hydrapulper," which resembles a giant electric blender. The hydrapulper, using giant rotating blades, separates the individual fibers in the pulp. Water is then added to form a mixture called "stock." Additional water is then added to the stock to make a dilute mixture, which is more than 99 percent water. The cellulose fibers in the water are then thoroughly separated in refiners before entering the process known as "forming." During the high-speed forming process, the fibers are molded into a sheet in less than a fraction of a second. The next process is drying. A continuous mesh belt (resembling a window screen) carries the sheet from the forming section to the drying section. In the drying section, the sheet passes around a large honeycomb cylinder where hot air is forced through the fibers to dry the sheet. In just a few seconds the sheet travels the entire length of the paper machine (which is the size of a football field) and is dried to 95 percent fiber and only 5 percent water. The sheet is then wound into large rolls, called "parent rolls," which can be more than 50,000 feet long. 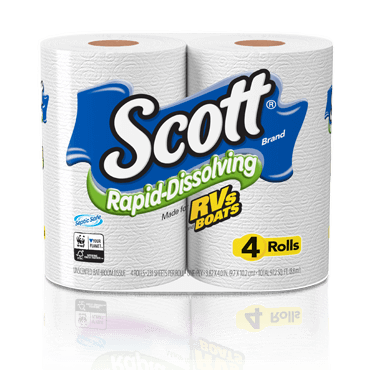 In the final process of the manufacturing process, known as "converting," the parent rolls are made into the SCOTT® Towels that consumers use every day in their homes. In the first stage of converting, the large rolls are placed on a machine called a "rewinder," where they are wound into smaller diameter rolls, called "logs." These logs are perforated to create individual sheets, then cut into appropriate lengths to create individual paper towel rolls. Finally, the paper towel rolls go through a packaging process where they are wrapped and inserted into boxes, so they can be shipped to retailers. While the paper industry uses a lot of water in the manufacturing process, the majority of that water is recycled. Water not reused is treated to remove contaminants prior to discharge. Careful controls and monitoring ensure that the water leaving the mill meets or exceeds water quality standards. Throughout the manufacturing process, Kimberly-Clark continuously looks for ways to reduce the amount of natural resources and energy used per unit of production. Each of the company's mills in the United States has energy conservation programs and receives technical support and advice from the corporate energy staff. Kimberly-Clark is also committed to the reduction of waste going to the landfill. Active waste reduction and recycling efforts are in place at each mill. Some mills have virtually eliminated all waste to landfills! Can I recycle the Scott® Towel packages? WHAT ARE SCOTT® FLUSHABLE WIPES? To help you feel cleaner and fresher than with toilet paper alone, we offer SCOTT® Flushable Wipes. These are flushable pre-moistened wipes for thorough cleansing and freshening. HOW CAN I BE SURE IT IS SAFE TO FLUSH SCOTT® FLUSHABLE WIPES? The flushability of Kimberly-Clark products is tested in accordance with trade association guidelines. These guideline tests demonstrate that when used as directed, our wipes clear properly maintained toilets, drain lines, sewers and pumps, and are compatible with on-site septic and municipal treatment. 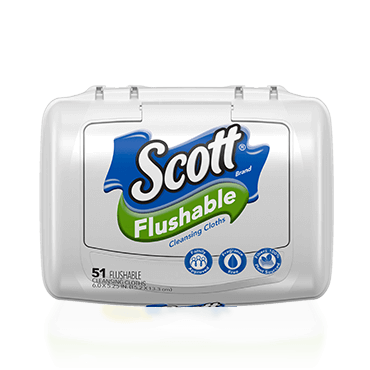 SCOTT® Flushable Wipes are 100% flushable due to SafeFlush Technology that allows them to lose strength and break up when moving through the system after flushing. WILL SCOTT® FLUSHABLE WIPES BREAK DOWN IN MY SEPTIC SYSTEM? Flushable Wipes are designed to safely break down in home septic systems and will not affect the normal bacterial activity in a septic system. DO SCOTT® FLUSHABLE WIPES CONTAIN OIL OR SOAP? No, SCOTT® Flushable Wipes do not contain oil or soap. However, they do contain mild skin cleansers and emollients. DO SCOTT® FLUSHABLE WIPES CONTAIN ALCOHOL? No, SCOTT® Flushable Wipes do not contain alcohol. CAN SCOTT® FLUSHABLE WIPES BE USED AS AN ANTIBACTERIAL WIPE? SCOTT® Flushable Wipes were not formulated to destroy bacteria during use. HOW LONG WILL SCOTT® FLUSHABLE WIPES STAY MOIST? The shelf life for unopened packages of SCOTT® Flushable Wipes is approximately two years. HOW DO I GET COUPONS OR SAMPLES FOR THIS PRODUCT? From time to time, coupons or special offers for SCOTT® Flushable Wipes are advertised in newspapers, available on our website and through e-newsletters. Occasionally you will also find coupons and other offers advertised at various retailers or on our packages. For additional questions about these and other SCOTT® brand products, call 1-877-856-7268, Monday through Friday, 7:30 a.m. to 7 p.m. Central Time. Can I recycle the Scott® Flushable Wipes packages? -Scott Flushable Wipes flexible package film cannot be recycled due to the type of plastic film required for moisture retention. -Scott Flushable Wipes tub is polypropylene (#5) and can be added to curbside recycling where #5 is collected.